With more than 10,000 customers and two million users Yellowfin ranks as one of the world’s 10 most popular Business Intelligence solutions, according to Capterra study. MELBOURNE, AUSTRALIA, February 28, 2017 – Capterra names global Business Intelligence (BI) and analytics software vendor, Yellowfin, one of the top ten most popular BI solutions in a comparative review by the software advisory site. 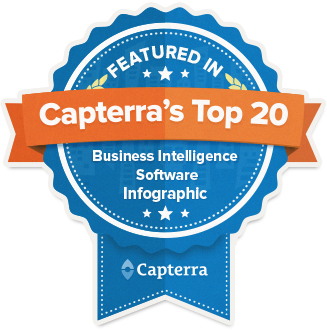 The 2017 version of Capterra’s Top Business Intelligence Software Products places Yellowfin ninth out of more than 400 BI products listed on its site, up from eleventh last year. In 2017, Yellowfin was positioned on Gartner’s Magic Quadrant for Business Intelligence and Analytics Platforms report for the fourth consecutive year*. Yellowfin also ranked first for ‘Innovation’ for the fifth year in a row in BARC’s The BI Survey 16** – the world’s largest annual survey of BI end-users. Capterra Senior Product Research Specialist, Rachel Wile, said that Yellowfin’s substantial growth in customer numbers was primarily behind its strong 2017 Capterra rankings results. “With 10,000 customers and two million users – double their user base from Summer 2016 – Yellowfin was able to move into the coveted top 10,” said Wile. Capterra’s BI Market Score is a non-revenue based representation of a company’s market share, converted to a 100-point scale. The report considers a company’s customer and user numbers (each is weighted at 40% of the final score) and social media presence (Facebook, LinkedIn, and Twitter followers as well as total number of Capterra reviews make up a combined 20% of the rest of the score). Capterra is a free software comparison service, listing and comparing business solutions from over 400 software categories. **Yellowfin has ranked first for the Innovation KPI within the ‘Self-service reporting-focused products’ and ‘Americas-focused vendors’ Peer Groups of The BI Survey for the fifth year in a row.